When I first heard about the short story collection Skeletons in the Swimmin’ Hole, Tales from Haunted Disney World, I had to read it. I love Disney World and firmly believe that it is the most magical place on earth. Where else can you go and have all your day-to-day stress disappear from your mind? For those happy days, your most pressing problem becomes which ride should you go on first? Can you use your Big Thunder Mountain FASTPASS and still make it in time for the character parade down Main Street, U.S.A.? Which remembrance is better, the Mickey Mouse sweatshirt or the ears? I’ve been to Disney theme parks many times, starting in fourth grade with my parents. Many years later, my husband and I got engaged at Epcot (on a bench near Norway after watching the fireworks.) After we got married, we visited Disneyland Paris on our honeymoon. Unfortunately, I ate a bad hamburger and spent the afternoon nauseated on a hill overlooking the castle. Let’s just say, my souvenir bag on the subway ride back to the hotel came in handy for more than just storing T-shirts. I was much healthier, thankfully, for our trip to Disneyland in California a couple years later. I’ve always wanted to visit the Magic Kingdom at Halloween-time and see my favorite characters parading by in costumes. I’ve read that they even have a Halloween fireworks show where the Disney Villains go trick-or-treating in the sky. 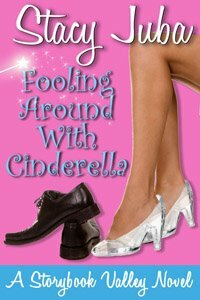 If you can’t make it to the Magic Kingdom for Halloween, then Kristi Petersen Schoonover’s new book is the next best thing. 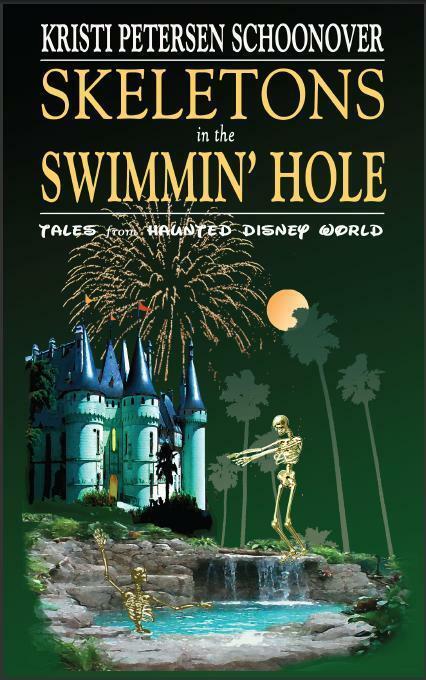 Her truly imaginative book Skeletons in the Swimmin’ Hole, Tales from Haunted Disney World, features six chilling ghost stories set in Disney Parks. Among the treats in store for readers, a thief is haunted by her sticky-fingered past, a woman wants an angry spirit to stop torturing her, and a teenager demands her parents expel her wicked sibling. But, each will discover exorcism isn’t as easy as going to Disney World. I usually prefer novels to short stories, however the premise of tales from Haunted Disney World intrigued me. Kristi Petersen Schoonover is a talented writer with a flowing, easy-to-read style. Her troubled characters and spooky storytelling captivated me and I read this book in a day and a half, always eager for when I could return to it. I found the references to Disney Parks in each story vivid and fun. Anyone who enjoys ghost stories will want to get a copy of this book, and this is must-reading for adult Disney Park fans. I enjoyed all the stories, but if I had to choose, my favorites were All This Furniture and Nowhere to Sit, and Charlotte’s Family Tree. In the former, a wife goes nuts bidding on expensive Disney memorabilia such as a Small World boat, a monorail cabin, and cars from the Peoplemover. As the house turns more and more into a deserted amusement park, eerie things begin to happen. In Charlotte’s Family Tree, a mother must confront the ghosts of her past in the Swiss Family Treehouse. Behind the haunting tales is the profound message that a person can escape from the world for a few days, but can never really escape himself. I can’t wait for more books in this delightful series. You can read more about the book and Kristi at http://haunteddisneytales.com/ and http://www.kristipetersenschoonover.com. Her book is available in paperback from retailers including Amazon under the imprint Admit One Literary Theme Park Press, and it is due out on Kindle and other electronic platforms in the next couple of months. I’ve been all work and no play the last few weeks, but Kristi’s stories provided me with a welcome break, transporting me to a magical place far away from the daily stress. Just like Disney World itself. Sounds like a great book, Stacy. I may have to pick up a copy for my husband, who’s a Disney freak. Of course, that means I get to read it, too. Thanks for sharing! It makes a nice holiday gift or birthday gift for any Disney fan who enjoys reading. Thanks for stopping by, Jaleta!